Bits of roasted cocoa beans are a perfect complement to the nutty flavor of buckwheat. Since buckwheat flour is low in gluten, it works like cornstarch (but with flavor!) to give cookies a fine sandy texture that is crunchy yet very tender. Serve the cookies with blackberry sorbet. Whisk the all-purpose and buckwheat flours together in a medium bowl. Set aside. In a medium bowl, with the back of a large spoon or with an electric mixer, beat the butter with the sugar and salt for about 1 minute, until smooth and creamy but not fluffy. Mix in the nibs and vanilla. Add the flours and mix just until incorporated. Scrape the dough into a mass and, if necessary, knead it with your hands a few times, just until smooth. Form the dough into a 12 by 2-inch log. Wrap and refrigerate for at least 2 hours, or, preferably. overnight. Position the racks in the upper and lower thirds of the oven and preheat the oven to 350 degrees Fahrenheit. Line the baking sheets with parchment paper. Use a sharp knife to cut the cold dough log into ¼-inch-thick slices. 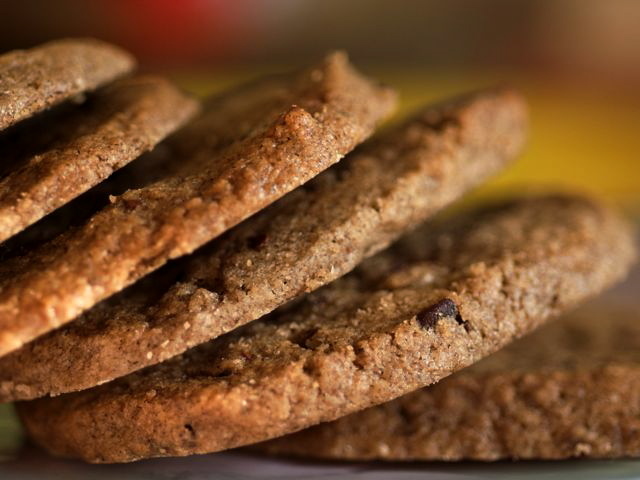 Place the cookies at least 1½ inches apart on the baking sheets. Bake until the cookies are just beginning to color at the edges, 12 to 14 minutes, rotating the baking sheets from top to bottom and front to back halfway through the baking. Cool the cookies in the pans on a rack, or slide the parchment liners carefully onto the rack to free up the pans. Let cool completely. The cookies are delicious fresh but even better the next day. They can be stored in an airtight container for at least 1 month.